Before I went to bed that night, I received a notification letting me know that I won the book! It is only Thursday and I received it in the mail. As soon as I opened it, I called Lily to my room so we could read it. I am so excited to share this book with you. 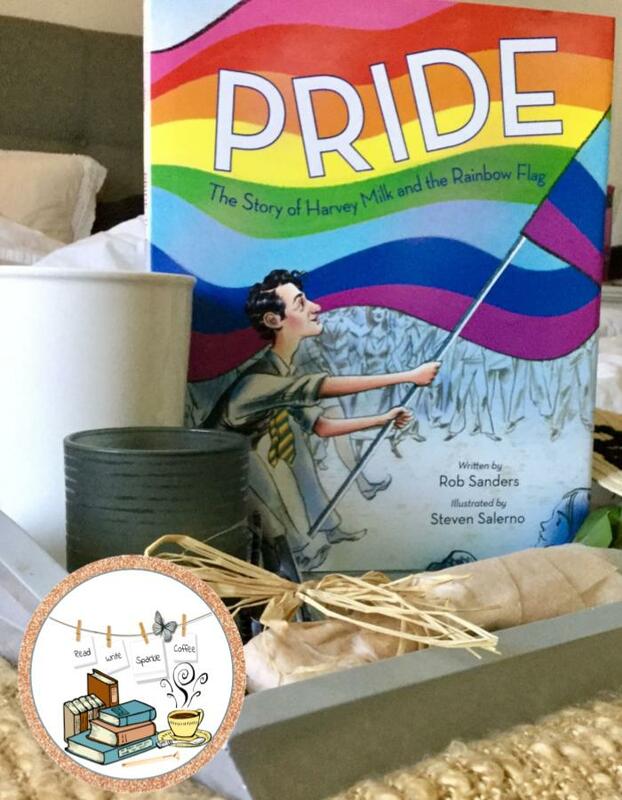 Pride: The Story of Harvey Milk and the Rainbow Flag by Rob Sanders. 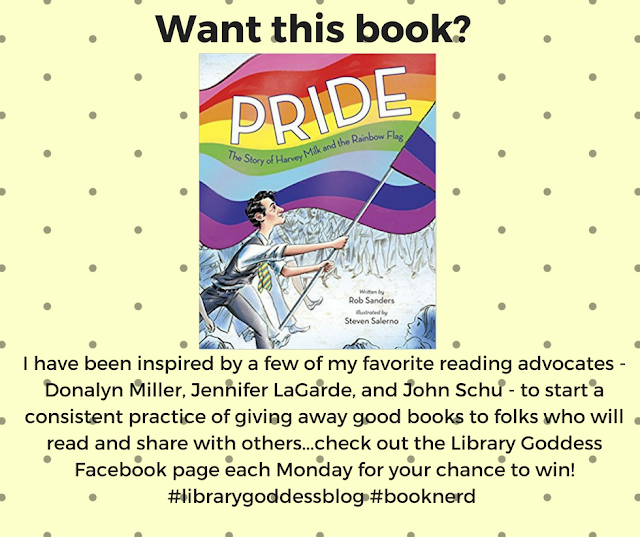 This book discusses the history of the Gay Pride flag created by Gilbert Baker and the social activist Harvey Milk. 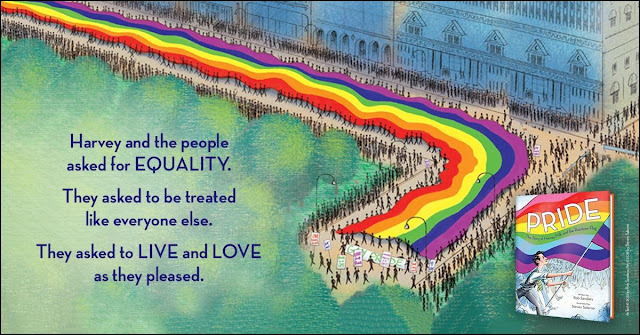 This beautifully illustrated non-fiction picture book, for children of all ages shares the message of HOPE, EQUALITY, LOVE & PRIDE. Amanda Foulk writes, "This book opens with a quote from Harvey Milk about hope, the connecting theme of this uplifting introduction to the symbol of the Rainbow Flag. The text starts with Milk's choice to enter politics and Gilbert Baker's design of the first flag and connects that to the flag's modern appearances as a symbol of equality and pride and the use of it on June 26, 2015 across the White House. 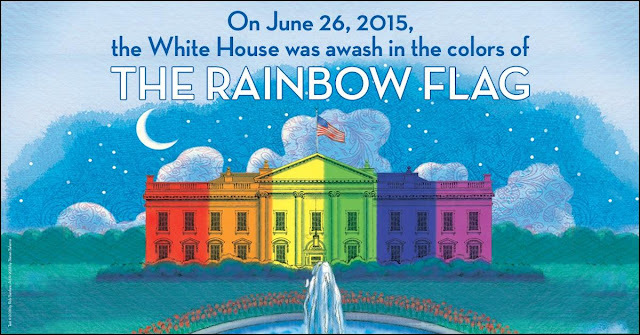 The narrative includes references to opposition to Milk's dream of equality and the assassination of Milk and George Moscone, but moves decisively on to tell of enduring hope, with an illustration of the candlelight vigil and the persistence of the rainbow flag as an icon." The concluding biographical notes include more information on the Gay Pride flag, Harvey Milk, and Gilbert Baker. In addition, there are two timelines, a few suggested resources further study, and assorted photographs related to the story. Earlier this month, I traveled to the Idaho Education Association Headquarters to assist in the creation of curriculum for a Summer Institute Professional Development on Racial Justice. We had a guest speaker who taught use more about LGBTQ students and how to better support them in the classroom. The speaker gifted us with some swag, which included this Gay Pride Flag. 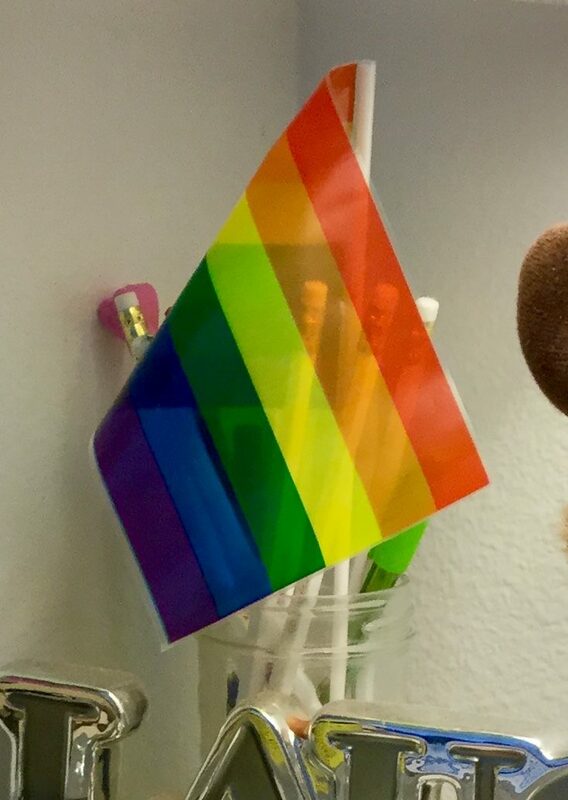 This is a reminder that the message of LOVE, HOPE, PRIDE, and EQUALITY is so very important in our classrooms. I delayed my sharing of this book to June 26th, in remembrance of the day in which the Supreme Court ruled that gay and lesbian Americans had the right to marry in every state in the country.